The Disciples were called “Christians” first at Antioch. A Christian is one who has turned from willful sin, and has put his trust in Jesus Christ as Lord and Savior (Rom. 10:9-10), recognizing that Jesus is the Son of the Trinity: Father, Son and Holy Spirit, three yet one. A Christian believes that Jesus came to Earth to redeem mankind from sin and death through the shedding of His own sinless blood on the cross at Calvary, that He was born of a virgin, lived a sinless life, and gave His life for us willingly on the cross. He was dead and buried, was raised from the dead, ascended into heaven, exalted and glorified. He continually intercedes for us and will come again for all those who have put their trust in him. God reveals all this in His word, the Bible, written by God Himself through man. Put your trust in God’s only son Jesus Christ today and ask him to come in to your life... He will begin a new work in you! 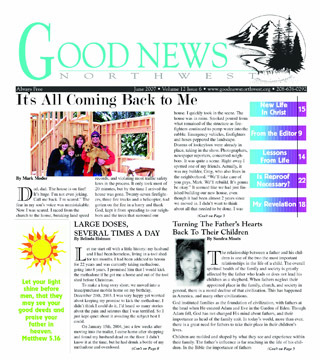 Good News is an opportunity for you to share what God has done for you, to honor him for his provision and blessing, and to point the way toward his mercy and love for those who have not yet received it. 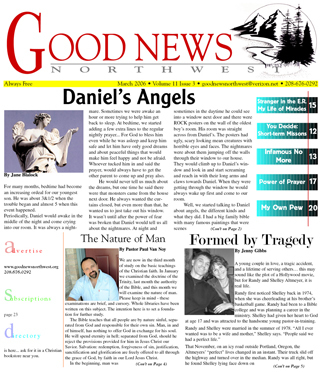 Good News purpose is to reach as many people as possible with the Good News of Jesus Christ through providing a forum through which a person can share what God has done in his/her life with the community at large. Good News also strives to bring unity to the body of Christ as a whole; we are not affiliated with a particular denomination. All submitted material will be examined with this purpose in mind. To submit material by email click here. 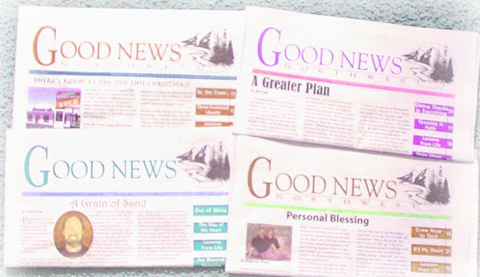 All submitted materials are subject to approval by Good News management.